Photo: Norris House, ca. 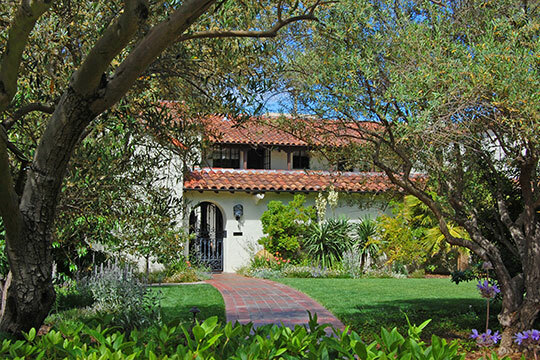 1928, 1247 Cowper Street, Palo Alto, CA. Listed on the National Register of Historic Places in 1987. Photographed by user:Eugene Zelenko (own work), 2010, [cc-by-3.0 (creativecommons.org/licenses/by/3.0)], via Wikimedia Commons, accessed August, 2013. Santa Clara County administrative offices are located at 70 West Hedding Street, San Jose, CA 95110; phone: 408-299-5001. Santa Clara is bounded on the north by Alameda County, and a portion of the Bay of San Francisco; on the east by Stanislaus and Merced counties; on the south by San Benito County; and on the west by Santa Cruz and San Mateo Counties. Its average length from north to south is 35 miles; its breadth from west to east, thirty miles; while it comprises about seven hundred thousand acres, or nearly one thousand and fifty square miles. The immense advantages of location, which the county possesses, may be at once observed on reference to a map of the State. It embraces all of the various lands suitable for the production of fruits, cereals or vegetables, or the raising of stock and timber. Within its boundaries there is little, if any, waste ground, while its poorest and roughest would compare well with what would be considered good farming land in some of the States on the Atlantic coast. Through its center runs that beautiful vale, marvelous in its fertility, which is the namesake of the county; on the west the Coast Range protects it from the bitter winds that cross the ocean; to the east a wall of high mountains bars the keen zephyrs from off the Sierra's snow; while the head of San Francisco's glorious bay skirts a portion of its northern extremity, where navigable sloughs and creeks intersect its shores, and penetrate to a considerable distance inland. The origin of the name which this county bears is thus described in a report made to the Senate under date April 16, 1850, by General Mariano Guadalupe Vallejo, then the Senator from the District of Sonoma, entitled, "Report of Mr. Vallejo, on the Derivation and Definition of the Names of the several Counties of California." In that report, unequalled in its style, and in the amount of information crowded into a small compass, he says of Santa Clara: "According to the Roman Book of Martyrs, or Martyrology, as Hortalana, the pious mother of Santa Clara, was once kneeling before a crucifix, praying earnestly that, being with child, she might be happily delivered, she heard a voice whispering, 'Fear not, woman, thou shalt safely bring forth;' whereupon a brilliant light suddenly illumined the place, and the mother, inspired by the mysterious prediction, baptized her child Clara, which is the feminine of clear, or bright. Clara was afterwards sanctified, on account of her many eminent virtues, and accordingly venerated by the Catholics in all Roman Catholic churches. The Mission of Santa Clara, from which the county derives its name, was founded on the twelfth day of January, 1777.